Aiming to further expand its footprint in the game development industry, GiG Games has hit 2019 big thanks to its innovative in-house slot game called Popstar. This 5 reel product with no less than 1,024 ways to win follows the music path of Swedish pop singer Erik Segerstedt and his rise to fame through a signing contest. Players will be taken on a musical journey straight from the audition stage all the way to the finals of a television talent show resembling the likes of X Factor or American Idol. Popstar is fully branded game where Erik produced all the sounds and special effects to get fully immersed into a neat little homage to his career. Popstar slot game will spring a hatful of surprises for players thanks to wilds, scatters, free spins and symbol upgrades accounting for the whopping 400,000-coin jackpot up for grabs. Popstar slot is GiG Games’ bold attempt to get straight into the big league. 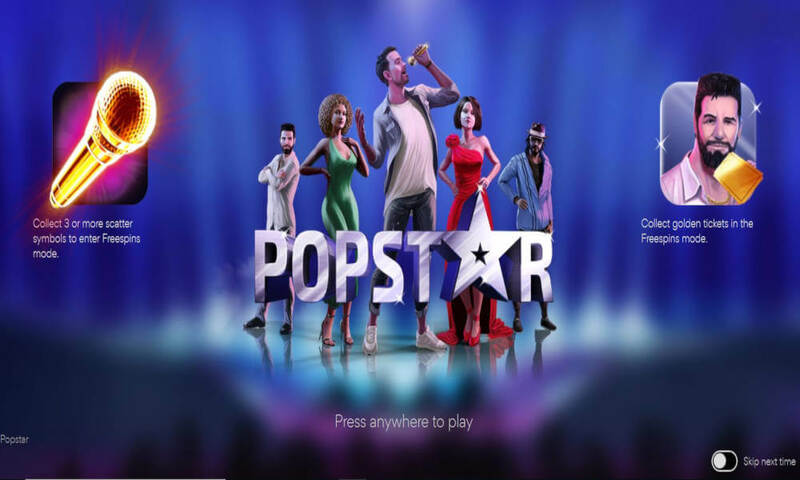 Despite being only their fourth game product, Popstar is an ambitious project which saw the company team up with a Nordic music star in an effort to create a sort of branded slot. Execution of the ambitious project did not exactly go according to plan as this great idea was presented through somewhat fuzzy graphics and naïve approach toward game creation. The main characters resemble the avatars you get to choose in first editions of the video game classic called The Sims. Playing card symbols – from 9 to Ace – are the low-paying denominations, whereas the royals are represented as talent show judges, our star performer Eric and music equipment such as golden microphone Scatters. The game pays for combinations of three matching symbols on any of the paylines, from left to right. Popstar enthusiasts are advised to first adjust the game controls and set up the bet value before hitting the spin button. Control dashboard is neatly placed below the reels – where you also get to select the AutoPlay if that’s your cup of tea. Feature-wise, GiG Games have done all there is to be done in order to make this music-inspired title as engaging as possible. The sheer presence of Erik Segerstedt and the soundtrack from his new project is bound to lure people in, while Popstar’s enticing gameplay is indeed a huge element of this game contributing to its overall reputation and potential. Free Spins Feature – three or more golden microphone Scatters will launch the free spins bonus which comes with a variable amount of complimentary rounds you can benefit from. Players can hope to get anything between 6 and 14 rounds, depending on the number of Scatters triggering the feature. Judge Points Feature – an in-feature bonus mode, this particular twist gives you a chance to collect Golden Tickets during the free spins and store them into four different containers to add two additional free spins. Each container can stock up to six tickets. Once filled to the very top, it will give you two more spins and will also turn all symbols represented as a Judge symbol into the top-paying denomination – Eric. It’s crystal clear what GiG Games tried to achieve with Popstar slot. With a talent show contest in its core, this game will take you down the path of glory – collecting golden tickets as tokens of approval from the judges. A sufficient number of golden tickets will replace all judge symbols with Eric as you happily enjoy the Free Spin bonus. With no less than 6 and up to 14 complimentary rounds to benefit from – along with a pair of extra spins – Popstar is wholeheartedly attempting to persuade us of its quality. The biggest drawback of this GiG Games early bird is the lack of edge – both visually and from the engine room point of view. This medium to high volatility slot will reward you with frequent hits but you could be in for lengthy sessions before the game actually gives you a chance to win big. Players, we need your help with how we should to rank and rate these reviewed casino games. You can help us by rating this game, and if you really enjoyed playing Popstar. You can also share it with your friends on Facebook, Twitter and via email. For all freeplay games, if your free credits run out, simply just refresh the page and your balance will be restored.